March was hectic. Part of it was the new job (old place, but new things to do), which included learning a bunch of stuff and also a giant project. Nevertheless, the brain proceeded with the directive ‘read all the books’. Here’s your March tally. I was pretty impressed with God’s War, so now I can move on to Infidel. More bug-based tech for everyone. I know what you’re thinking. You are thinking: ‘Is that really something called Reagan at Reykjavik in that pile?’ Um, yes it is. I like my Cold War histories, shush. The one below it is about MacArthur in Japan. I’m an old man, I like my military histories too. Testo Junkie is an intense gender studies volume. The way I can describe is that it’s really very readable while being nigh-incomprehensible in places. James A. Corey and Gene Wolfe are long overdue for a read. Once again, I know what you’re thinking. 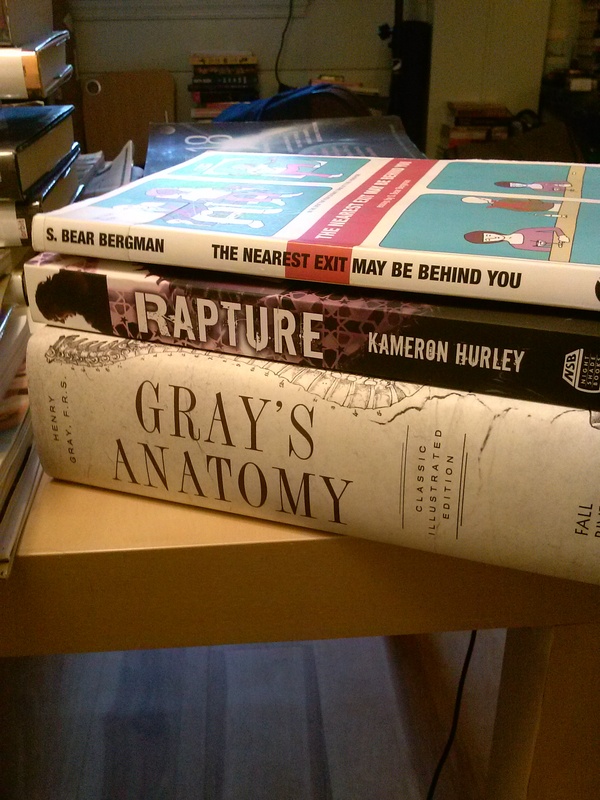 You’re thinking: ‘Is that seriously Gray’s Anatomy there?’ Yes, yes it is. Also, look, Rapture is there too, for when I’m done with Infidel. And also the best book of essays on trans* issues I’ve ever read. I do not have words to describe how good this is. 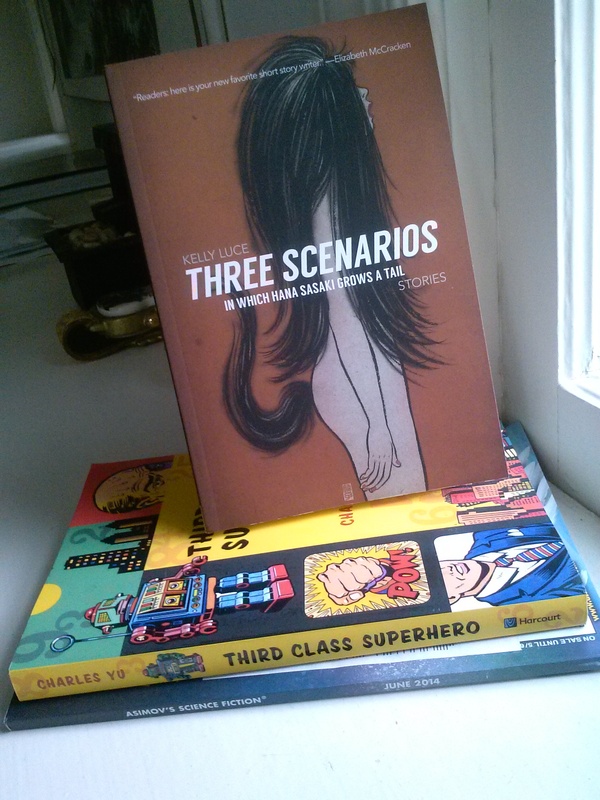 Three Scenarios in Which Hana Sasaki Grows a Tail by Kelly Luce is published by a tiny publisher called A Strange Object. My friend and I are quite excited about them. Unfortunately, I will have read all their output when I finish this collection. They seem to have good taste in short stories and I hope they publish more stuff (plus, their books are pretty). There is also Charles Yu’s collection of short stories that I have never seen before and an Asimov’s under it. 14. Robert Jackson Bennett, City of Stairs. Review of this will be forthcoming, errr, some time in the summer. The book is not out till September, and publishers frown upon extremely early reviewing. All I am going to say is that I am really tempted to use all caps now to describe how damn good this book was. I sat down and read to the point when I was sick of words. So yeah, never got to that Reagan book. Holy, what a haul. Let’s see…yes, yes you MUST read The Expanse series, great stuff that. And oh sweet SAGA! The third volume also arrived in my mail last week and I’m dying to dig in. I agree, this comic is amazing. You managed Downbelow Station and a bunch of other things all in the same month? That’s a chunky read. Leviathan’s Wake is fun, though I think the series gets better as you go. I’m with you on the history. 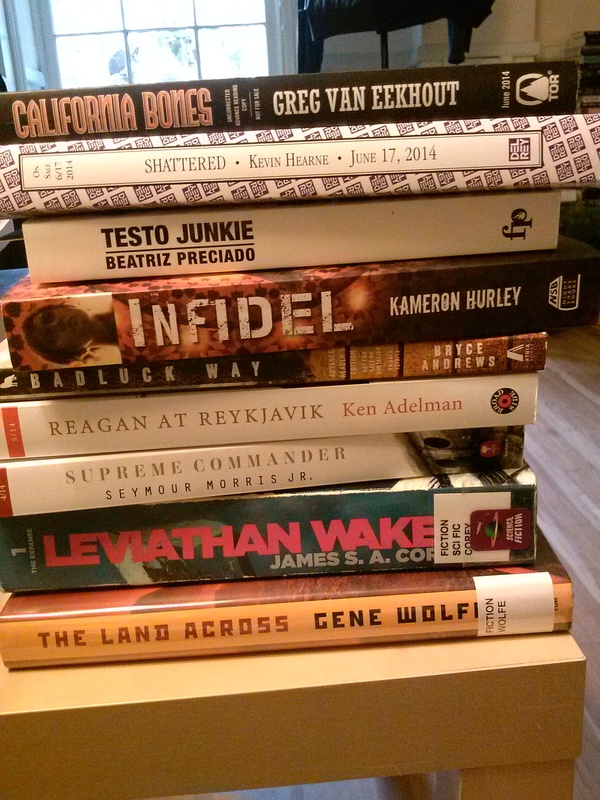 If my current TBR were a little less intimidating, there would be more history on my pile as well. Yeah, the problem with nonfiction is that it takes some time to read. I’ll post my review of Downbelow on the next few days. It was kind of an uneven read for me. I like series that get better! I’ll start in the beginning and see how it goes. I wish I had time for more non-fiction. You’d think grad school would have burned me out for that sort of thing, but I guess not. I’m going to be cutting my commute in half, so there goes my reading time. I haven’t figured out how to compensate yet. I remember enjoying Downbelow Station, but somehow it hasn’t stayed with me as much as other Cherryk books. Not sure why. I basically have no commute (I literally live down the street from work), but that means I can stay up a little later reading because I don’t have to wake up early :). 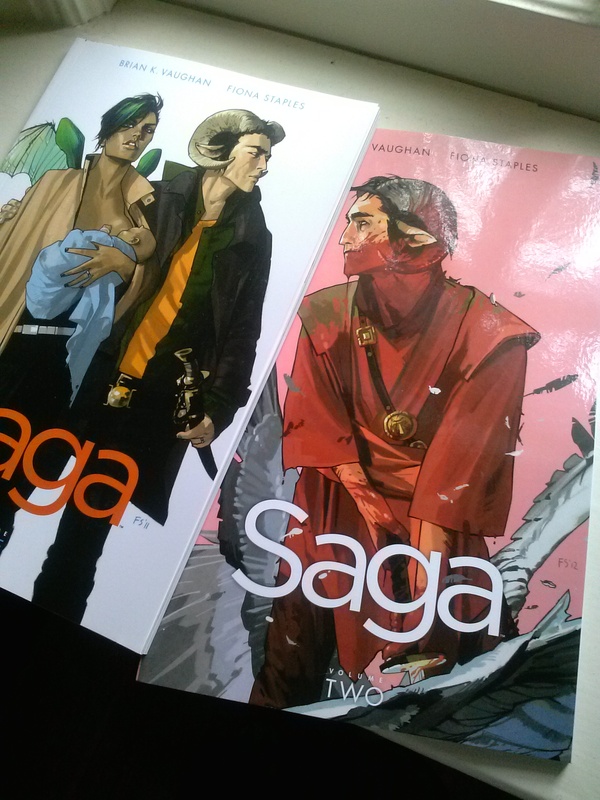 I can’t wait to read Saga. And the Charles Yu! I hadn’t seen that either. But now I have thanks to you. Yeeeeees. So far I have loved everything of his. How to Live Safely went right onto my favorite books ever list actually, though I feel like I should reread it at least once before I can really say that. Saga… oh it’s so good.